1. Preheat oven to 340F/ 170C. 2. Place the eggs, sugar, butter, desiccated coconut, lemon and orange zest and juice, coconut milk and flour in a food processor and blend until well combined. 3. Pour into a buttered 22cm (9 inch) pie tray. 4. Place pie tray at the lower rack of the oven and bake for 60 - 80 minutes. 5. Loosely cover with aluminium foil when you find the pie turning brown during half way of baking. 6. Set aside to cool, then refrigerate for 1 hour to chill. 7. 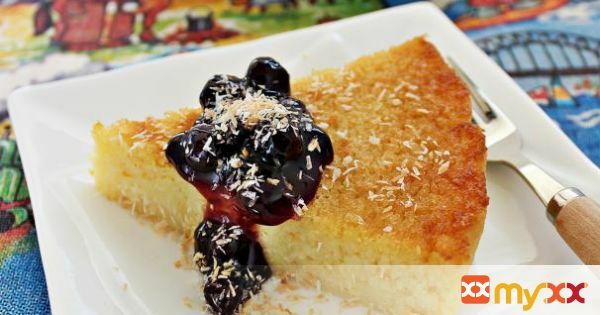 Slice and serve with a little whipped cream and passion fruit or blueberry jam and sprinkle some toasted desiccated coconut over it.